Kokkino Chorio, Crete. Kokkino Chorio (Red Village) in Chania. The origins of the village in Apokoronas, Chania in Crete would fit nicely in a Game of Thrones chapter. Its name literally means “Red Village” and it earned that name as grimly as you might imagine: from a massacre of 150 women and children by the Ottoman military. You wouldn’t know it though, when you visit Kokkino Chorio now- it’s beauty and picturesque vistas have even made it the setting of the famous 1964 classic film “Zorba the Greek” starring Anthony Quinn and Irene Papas! The village is small and very traditional looking with three beautiful churches. It overlooks Souda Bay, and is well known for its stunning bird’s eye view of the entire bay and cove, making a perfect romantic backdrop for couples and a relaxing, soothing spot for rest and calm contemplation or just a lush cup of coffee! If you like history, especially modern history, there’s an entire WWII underground bunker network for you to see, with interconnected bunkers that had been used at the time. Locals will tell you how well equipped it used to be and inlaid in wood in the inhabited areas, even sporting a cinema! 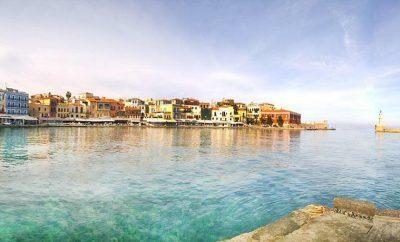 A half-hour drive away is the beautiful Old Town of Chania with its historical venetian harbor, cobblestone paths and side streets that seem taken right out of medieval times and the best Archaeological Museum of the area. Not too far away from the village you will also have a chance to visit the famous and tragic historical monastery of Arkadi and, if you want to benefit from a beautiful two-hour road trip through rolling hills and under the imposing White Mountains, you can even visit the Palace of Knossos for your fill of ancient Minoan history. If you’re seeking relaxation at the beach, Kokkino Chorio is the perfect base of operations for you, as it grants you easy access to an array of beaches below it: If it’s sandy beaches you want, you’ll need to go to Kiani Akti, Kera and Koutalas beaches. All of them are sandy, calm and beautiful. Kiani Akti (Blue Beach) has sunbeds and umbrellas while Kera and Koutalas are not organized and remain pristine and unspoiled. If you’re looking for something wilder, then it’s Obrogialos for you: Though it sports a pier where you can lounge around and sunbathe or dive into its deep green and blue waters, you can also do sports such as snorkeling and windsurfing. Its rocky bay calls for adventure- and when you’re tired, there’s a popular tavern right above it where you can relax and enjoy good food. If you’re seeking the beauties and wonders of the earth rather than the sea, then you can visit the nearby gorges, from the nearest one called Stilos to the on farthest away but also the most famous and stunningly beautiful, the Gorge (Faraggi) of Samaria, and enjoy a good day of hiking. Kokkino Chorio has something for everyone and every style of vacationing you might be going for- and it promises that you will leave with unique and cherished memories and photos. [This article is subject to copyright unless specifically stated otherwise. You may not copy, store, share or redistribute any content by any means mechanical or electronic without the express written consent of the copyright owner].